Baby: why did u each tomato? Baby: Recently you have a lot of other activities besides drama(like cf)? HJ: although very busy, still happy about that. Always think about how to present my best image in front of everyone, also feel a bit burdensome, yet wanna show a handsome and diligent me in front of all everyday. Baby: Is it that hard to become friend with ex-gf? just a sigh, how do you think? HJ: it is very hard, really hard to keep relationship as friend, try to be friend gradually, if it happens that the feeling for each other comes back, should be ok to date again, that’s fine. Baby: HJ hyung..HJ shi is good at drawing, right? Baby: why do you hit me?we’re doing program now! Baby: in a recent interview you were saying “the stuff you cherish the most is Hyungjoon”? what kind of question it is? am i regarded as stuff? Baby: so i’m like a toy? HJ: I didn’t say that, ok, i’ll assign you as my personal toy! 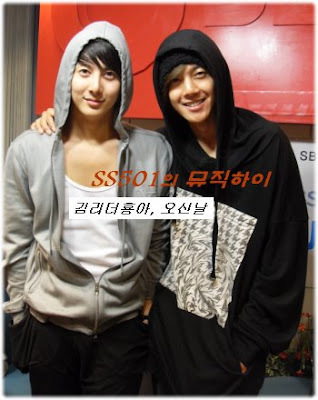 HJ: Jihoo?Jihoo was over a long time ago,I am Kim hyunjoong from the very beginning, the popularity of BOF was really extraordinary, a lot of ppl got to know me from Yoon Jihoo and then started to know what kind of person Kim Hyunjoong is, it seems that i should make efforts to set up Kim Hyunjoong image so that ppl can know me better. Baby: What did u say? Baby(covered his mouth, pretending crying): really cool!! HJ: Yes, please expect a progressional Kim Hyungjoon in 2009! Baby: yea, arent you B? HJ: B type is not like this, sure that person is B? not AB? HJ: Please don’t bother me on this,hope you 2 get along well with each other. HJ read the letter: Is Hyunjoong oppa really 4-dimensional? Baby: you can randomly introduce yourself. HJ: Like those 4th-dimensional character,didn’t i get a lot of love from audience becoz of that? HJ: ppl think this is my fascination, so i don’t care about that any more, we’re in a 3D world, not 4D, so just take it as 3D is fine. Baby: so every audience, did you get that? KHJ shi just has that unique fascination, not 4D, right? that’s fine? 2HJ: go ahead and eat!dont starve urself! HJ: go and eat, you won’t get fat becoz of that! Baby: our theme today is LOVE! if you luv each other, you’ll look alike in appearence, even the characters and from a lot of trivial things are alike each other, right? Baby: cooperate with the other, right? HJ: Give you my present–Hyungjoon!especially for you! Baby: how do you think? dating…. Baby: yea, dating is necessary, right?why you suddently stopped? hyunjoong shi? HJ: should be like that right? Baby: SS501 <A song for you>, how is it?had fun, right? Baby: it’s coming to the end for this 1-hour program, had fun today, right? HJ: Me 2, danced at 2:00 and had fun, also read a lot of messages from the audience, i was in a good mood, radio is attractive becoz even if you’re not able to see face to face, communicating simply via words is great. Audience: I’m fishing now, when did hyunjoong oppa go fishing recently? Baby: did you get a lot of fish? 1 Response to "TRANSLATION OF 5/23/09 Music High"